Unusual Alliances Form In Nebraska's Prenatal Care Debate : Shots - Health News The state's Legislature voted to spend government funds on prenatal care for illegal immigrants. The governor vetoed the legislation, but some lawmakers are looking to override the veto in a vote on Wednesday. Nebraska Gov. Dave Heineman vetoed a bill that would spend government funds on prenatal care to illegal immigrants. He has that service for illegal immigrants should be provided by churches and private organizations, not with taxpayer money. In Republican-dominated Nebraska, government leaders often line up together, but lately a political tornado has ripped through this orderly scene. A political showdown over taxpayer funding of prenatal care for illegal immigrants has produced some unusual political splits and alliances in the statehouse of the Cornhusker State. "I am extraordinarily disappointed in your support of taxpayer-funded benefits for illegal aliens," said Republican Gov. Dave Heineman as he read a letter he wrote to fellow Republican Mike Flood, speaker of Nebraska's officially nonpartisan Legislature. Heineman was referring to a bill he subsequently vetoed that would restore publicly funded prenatal care for women in the country illegally. Until two years ago, Nebraska was one of about 15 states providing that benefit. Nebraska dropped the coverage when the federal government said the state couldn't use Medicaid funds, though it offered to continue funding under another program. 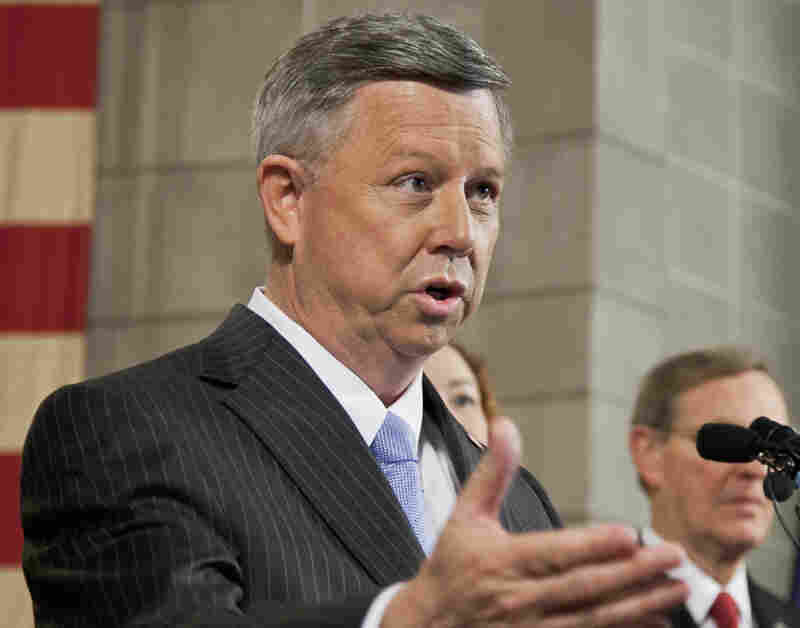 Heineman frames the issue as one of the benefits to illegal immigrants. Flood, a leading abortion opponent, says pregnant illegal immigrants will ultimately give birth to babies who will be U.S. citizens. He says providing them with prenatal care is consistent with his opposition to abortion. "If I'm going to stand up in the Legislature and protect babies at 20 weeks from abortion, and hordes of senators and citizens are going to stand behind me, and that's pro-life, then I'm going to be pro-life when it's tough, too," Flood said. The issue has exposed a fault line between anti-illegal-immigrant sentiment and anti-abortion groups, but it's also brought together an unusual coalition. Among those supporting the bill is the politically influential Nebraska Right to Life organization. "We don't want to distinguish that because ... of a baby's circumstances or in whose womb that baby resides that dictates whether that baby receives care or not," said Julie Schmit-Albin, the group's executive director. Another supporter is the Nebraska Appleseed Center for Law in the Public Interest, which advocates for immigration reform and access to universal health care. Jennifer Carter, the center's public policy director, says the immigrants are our "neighbors" and should be helped. "They're in our communities and they're helping contribute to our communities," Carter said. "So we believe providing this kind of prenatal care coverage to their children is appropriate." Still, Heineman, backed by what Republican Party polls say is a clear majority of voters, remains adamant in his opposition, though he calls himself strongly anti-abortion. "Most Nebraskans and I agree, we support prenatal care, but in the case of illegal immigrants, it should be done by churches, private organizations, charities, private individuals — not the use of taxpayer funds," he said. Supporters of the bill, on both sides of the abortion debate, cite their own polls in support and say the savings from avoiding intensive care for babies born without prenatal care would outweigh the costs of the program. With the governor turning up the political heat, the question now is whether enough legislators will vote to override the veto. That vote is scheduled for Wednesday.